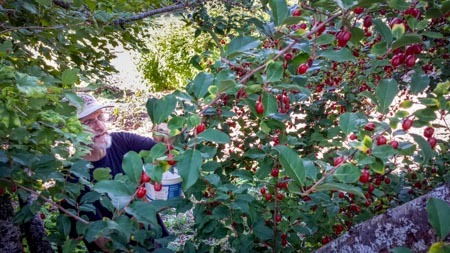 Sunday at the Edible Hedge gave community the opportunity experience an early summer harvest. Although most harvests from Meadowbrook’s Edible Hedge are not traditional, the curiosity and opportunity to taste and learn is great. The Goumi Berry harvest was plentiful and TART! Has a small pit as well…Orchard Steward John S worked from a shady spot as the weather on this day was rather warm. Good job, John!